The Witch’s Butter complex of species (T. “mesenterica”) are our most common orange, jelly-like fungi in the Pacific Northwest. They are very similar in shape, size and color to Dacrymyces palmatus and microscopic examination is often necessary to distinguish the two normally. As a general rule of thumb however, Tremella mesenterica tends to grow on dead hardwoods, while Dacrymyces tends to grow on conifers. 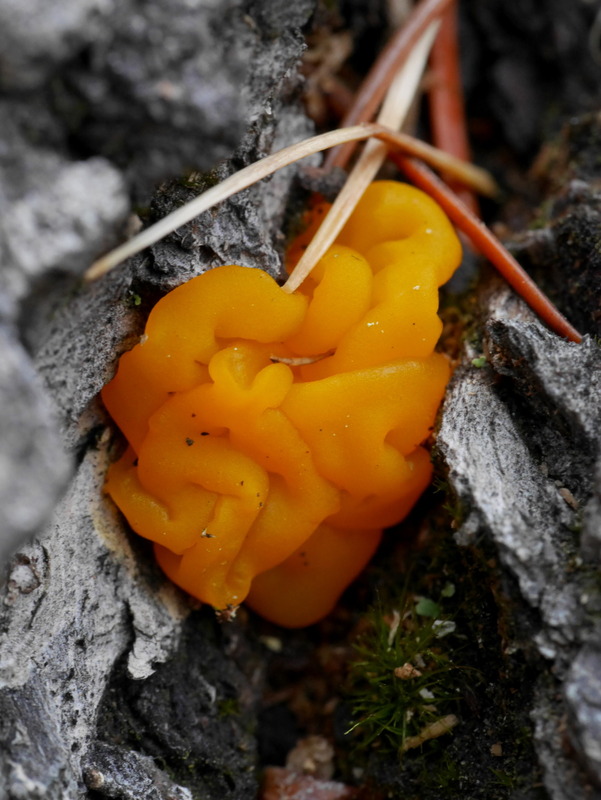 Tremella is an obligate parasite of the crust fungus Peniophora, which can also be a good indicator of species identity for this jelly fungus (the closely related T. aurantia is also an obligate parasite of a rot fungus, but it only grows on conifers). This particular specimen is growing in between the large, ridged bark of a downed Cottonwood (Populus trichocarpa).